A primary school in Queen’s Park which is due to convert to academy status has dumped its proposed sponsor. Salusbury Primary School, in Salusbury Road, had planned to seek a partnership with Park Federation following a poor Ofsted report – but it has emerged that the school has pulled out of the agreement after a breakdown in relations. The school currently has a consultant head teacher in place following the departure of the previous head last year. But it is alleged that PF’s chief executive wanted to draft in a friend as head teacher at SPS, causing unrest within the school. 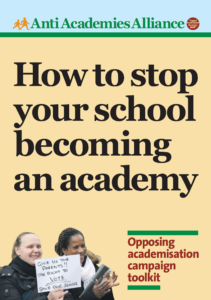 Under new governmental rules, schools which get poor Oftsed reports are forced by the Department for Education (DfE) to convert to academy status meaning they have a sponsor placed with them or have to find their own. 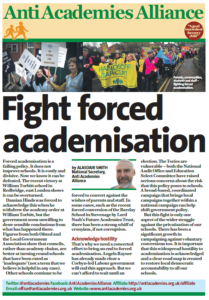 They then break away from local authority control and are funded centrally but critics claim it is a form of privatisation with organisations running them for profit. 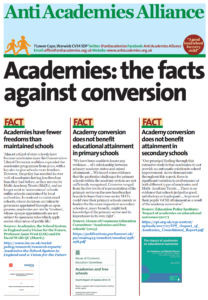 This entry was posted in News and tagged Forced academisation, Headteachers, Primary, Sponsors. Bookmark the permalink.